I would be able to help in any way I can boss man. Any idea when there will be feedback about who the detachment chooses for each garrison? I have Police Officer status and live in Illinois. 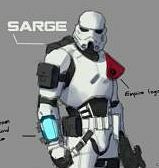 I can head up the Midwest Garrison area. I have built my armor by myself and own a quartermaster backpack. I know the differences between TD/TK. I have knowledge about armor build, backpacks, guns, pouches, etc. I have also built: A Biker Scout, ARF trooper in camo, and Sith Lord. I have been in the legion since 2011. I mentioned his name at an event last week.. it seems not too many people know his work... I can tell ya being a newbie that he was a great find to help with my build. ATA kit arrived - now what?